"For readers of Atul Gawande, Andrew Solomon, and Anne Lamott, a profoundly moving, exquisitely observed memoir by a young neurosurgeon faced with a terminal cancer diagnosis who attempts to answer the question What makes a life worth living? At the age of thirty-six, on the verge of completing a decade's worth of training as a neurosurgeon, Paul Kalanithi was diagnosed with stage IV lung cancer. One day he was a doctor treating the dying, and the next he was a patient struggling to live. And just like that, the future he and his wife had imagined evaporated. When Breath Becomes Air chronicles Kalanithi's transformation from a naïve medical student "possessed," as he wrote, "by the question of what, given that all organisms die, makes a virtuous and meaningful life" into a neurosurgeon at Stanford working in the brain, the most critical place for human identity, and finally into a patient and new father confronting his own mortality. What makes life worth living in the face of death? What do you do when the future, no longer a ladder toward your goals in life, flattens out into a perpetual present? What does it mean to have a child, to nurture a new life as another fades away? These are some of the questions Kalanithi wrestles with in this profoundly moving, exquisitely observed memoir. Paul Kalanithi died in March 2015, while working on this book, yet his words live on as a guide and a gift to us all. "I began to realize that coming face to face with my own mortality, in a sense, had changed nothing and everything," he wrote. "Seven words from Samuel Beckett began to repeat in my head: 'I can't go on. I'll go on.'" When Breath Becomes Air is an unforgettable, life-affirming reflection on the challenge of facing death and on the relationship between doctor and patient, from a brilliant writer who became both. 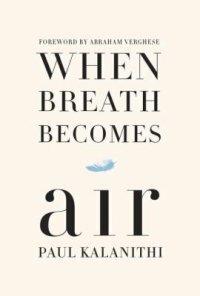 Advance praise for When Breath Becomes Air "Rattling, heartbreaking, and ultimately beautiful, the too-young Dr. Kalanithi's memoir is proof that the dying are the ones who have the most to teach us about life." --Atul Gawande "Thanks to When Breath Becomes Air, those of us who never met Paul Kalanithi will both mourn his death and benefit from his life. This is one of a handful of books I consider to be a universal donor--I would recommend it to anyone, everyone." --Ann Patchett"-- Provided by publisher. Too sad submitted by Susan C on June 20, 2016, 2:21pm While this would be easy to read, it was too sad. I could not finish the book. Moving submitted by hcf on June 22, 2016, 6:19pm I was so moved reading this book. Kalanithi said he was an "ambassador for death" and I thought his writing was beautiful. Worth the tears you will surely shed. Beautiful & sad submitted by RowanEMH on July 9, 2016, 8:34am I listened to this book through the Midwest Library Collective. It is not an easy book. Though the medical portions are accessible and the narrative easy to follow, we know how it ends from page one so there is a continuous under current of sadness. That said, it is a beautiful book and I find myself thinking about it weeks after finishing it. Interesting Introspection on Death submitted by cmegane on June 22, 2017, 9:49am While it's easy to see this book as simply sad, I found that it covered much more complex feelings regarding life and death. As a medical professional, I found the medical portions interesting and easy to understand but I still think that those parts were written in a way that wouldn't scare off others. This is not a plot-driven book but the narrative is engaging and easy to move through. Kalanithi brings much to this book by being both a writer and medical professional. His movement through various stages of understanding regarding life and death was beautiful and vulnerable. When Breath Becomes Air submitted by leighsprauer on November 6, 2017, 12:38pm When Breath Becomes Air by Paul Kalanithi is the collection of reflections of a neurosurgeon who has been diagnosed with terminal lung cancer. Something less than a memoir, it is Kalanithi's coming-to-terms with his own mortality, legacy, and philosophy of life and death. He views death not as something to be avoided at all costs, but simply another part of life. Although Kalanithi's writing is good, his story compelling and heart-breaking, and the book highly recommended, I found that I didn't like it as much as I had expected. For one thing, his hubris as a neurosurgeon - he talks several times of making the decision whether a person's life is worthy of fighting for - was off-putting. Although I agree that extraordinary measures should not always be taken to prolong life, and that the acceptance of one's own death is a courageous act, he seemed to lack the humility that I would hope for in someone who routinely took others' lives into his hands. And although he certainly has uncommon courage in accepting his limitations and in living a meaningful life in the face of terminal illness, but I would stop short of calling it heroic courage. His wife's epilogue, however, was breathtaking. Simply written, from what was clearly a devoted and loving spouse, her account of his final days and his legacy was by far the most moving part of the book. Maybe because I prize humility above almost all other virtues, it was lovely to hear her words of praise for her husband, while his own account of his life and accomplishments fell flat. Full of so much truth and beauty submitted by EJZ on June 18, 2018, 8:36pm A book about the love of medicine, literature, science and religion. In equal measures this spare book is about living and dying, intensely personal and yet broadly relatable. I'd recommend it to anyone. Extraordinary submitted by Cihendricks on August 29, 2018, 10:09am A beautiful book about living and dying; while it deals primarily with Paul's own experiences, it is very relatable. It is a must-read for anyone. Description: 228 pages ; 19 cm. Lungs -- Patients -- Biography.